David Hockney (British, b. 1937) has produced some of the most vividly recognizable and influential works of the twentieth century. Hockney gained notoriety in his mid-twenties, after receiving the Gold Medal from London's Royal College of Art, and he quickly became one of the defining figures of the British Pop Art movement. In the late 1960s Hockney relocated to California and established himself as a prolific figurative and landscape artist. He is perhaps best recognized for the works he produced there: brightly colored, large-scale evocative images of the Southern California lifestyle, and domestic, intimate portraits of his friends, family, and lovers. Hockney's works are notable for their quietness of subject, flatness of space, and subtle reduction of form. Throughout his career he has worked in a wide variety of media, including painting, drawing, collage, photography, and printmaking, often utilizing contemporary technologies, including fax machines, laser photocopiers, and other 20th- and 21st-century digital instruments. 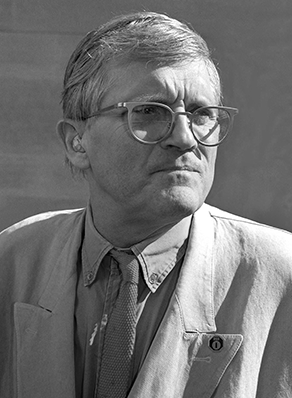 Hockney has received a vast number of awards and honors, including the First Annual Award of Achievement from the Archives of American Art, Los Angeles; membership to the Board of Trustees of the American Associates of the Royal Academy Trust, New York; Distinguished Honoree of the National Arts Association, Los Angeles; the Lorenzo de Medici Lifetime Career Award of the Florence Biennale; and nine honorary degrees from institutions worldwide. In 1997, he was made a Companion of Honour from the British and Commonwealth Order for his outstanding achievement in the arts. David Hockney's work can be found in numerous distinguished public collections around the world, including the Museum of Fine Arts, Boston; the National Gallery of Australia, Canberra; the Art Institute of Chicago; the National Portrait Gallery, London; The Tate Gallery, London; the J. Paul Getty Museum, Los Angeles; the Los Angeles County Museum of Art; the Walker Art Center, Minneapolis; the Metropolitan Museum of Art, New York; the Museum of Modern Art, New York; Centre Georges Pompidou, Paris; the Philadelphia Museum of Art; the Museum of Contemporary Art, Tokyo; the Museum of Modern Art, Vienna; the Hirshhorn Museum and Sculpture Garden, Washington, D.C.; and the Smithsonian American Art Museum, Washington, D.C. He lives and works in Bridlington, England and Los Angeles.